Novak Djokovic, coming from injury-ridden and largely unsuccessful 2 years of tennis, won his 4th Wimbledon title and 13th Grand Slam defeating Kevin Anderson in straight sets 6-2, 6-2, 7-6. This was Djokovic’s 13th Grand Slam title, one less than Pete Sampras’ 14 titles. The first South African in a Wimbledon final in 97 years, Anderson was unable to emulate the inspiring tennis that saw him ousting the defending champion Roger Federer in the quarter-finals and the intensity of his record-breaking clash with John Isner. Djokovic, entering the tournament ranked 21 and seeded 12th was a clear favourite despite the uneventful couple of years. Anderson, a surprise finalist was the underdog but failed to pose any challenge to the Serbian. In the Ladies’ Singles, Angelique Kerber won her 3rd Grand Slam and the first Wimbledon, defeating Serena Williams in straight sets. Mike Bryan and Jack Sock won the Men’s Doubles title. However, this edition of the Wimbledon will forever be known for the record-breaking semi-finals. Both the semi-finals lasted for over 5 hours and became the longest semi-finals in Wimbledon history. The final was a stark contrast to the high-adrenaline and competitive semi-finals both running over 5 hours. Kevin Anderson started on the back foot and stayed there the entire duration of the match. He was unable to emulate the serves from his match-winning effort against John Isner. Everything Anderson served, Djokovic returned. In the first two sets, Djokovic lost only 4 games out of 12. In the third set, Anderson did look slightly more menacing, managing to hold his serve till the tie-break. Anderson made desperate attempts to stay in the game in the third set, stretching the game to a tie-break. Djokovic though looked fit and hungry for his 13th Grand Slam and the first in 2 years. He was relentless and in no mood to play any more than absolutely necessary, ending the game in 3 sets. Djokovic played with such efficiency and precision, despite playing a physically and emotionally draining 5-hour semi-final just the previous day. The semi-finals were intense. Anderson entered the final after defeating John Isner in a gruelling and marathon match that lasted 6 hours and 36 minutes. The final set itself was 2 hours and 50 minutes long. Anderson won 7-6, 6-7, 6-7, 6-6, 26-24. This was the second longest match in Wimbledon history. Djokovic demonstrated an exceptional defiance and resilience to deny Nadal his 5th Final appearance in the last 7 Grand Slams. Djokovic triumphed 6-4, 3-6, 7-6, 3-6, 10-8 over a course of two days, thanks to the Anderson-Isner epic. The first semi-final was played between the 8th seen South African Kevin Anderson and the 9th seed American John Isner. Anderson was riding high on an exceptional run at the Championship, handing out a shock exit to Roger Federer in the Quarter-Finals. To defeat a peak-Federer from two sets down speaks volumes of Anderson’s character. His resilience was again on display against Isner as he became the first South African to reach the Wimbledon final in 97 years. The semi-final, which was the longest in Wimbledon history and third longest match overall at Wimbledon, was dominated by serves with little to no returns. The two played only 30 rallies of 9 shots or more. The 6’8” Anderson and 6’10” Isner together hit 102 aces with Anderson landing 49 aces to Isner’s 53 aces. Isner, in fact, is third on the list of most aces on all surfaces with 10,229 aces. He’s only behind Ivo Karlovic and Roger Federer. Anderson won 84% of his first serve while Isner won 78%. Anderson won 4 break points which proved crucial in ending the marathon final set. The second semi-final was a battle of giants and arguably two of the greatest tennis players of all time. Rafael Nadal, World No. 1 and first seed, entered the Championship after a spectacular couple of years of tennis, winning 3 of the previous 5 Grand Slams. By contrast, Djokovic, currently ranked No. 21 and seeded 12th at the Championship, was playing his first semi-final since the US Open in 2016. Djokovic defeated the Spaniard 6-4, 3-6, 7-6, 3-6, 10-8 in 5 hours and 16 minutes, the second longest semi-final in Wimbledon history. 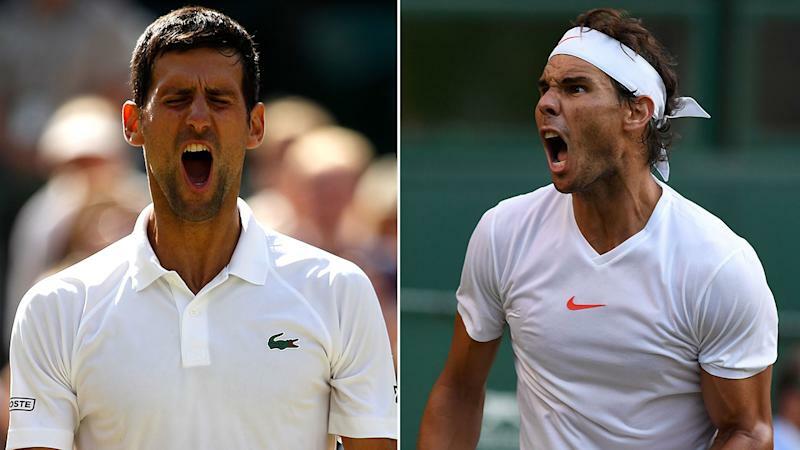 Owing to the marathon first semi-final, the Nadal-Djokovic clash was suspended after 3 sets. The two resumed play on Saturday with Djokovic leading 2-1. Djokovic was at his best when he served impeccable aces (23 total) to save break points at crucial junctures of the game. The Championship saw its first surprising result when the Stan Wawrinka, ranked 225 currently, ousted the 6th seed Grigor Dimitrov in the first round. Next on the list of casualties was the 4th seed and current World No. 3 Alexander Zverev who lost to World No. 133 Ernest Gulbis in the third round. Zverev was one of the tournament favorites. The biggest shock, however, was the exit of 8-time Wimbledon champion Roger Federer. Federer lost a 2 set advantage against a resilient Anderson in a 5 set quarter-final to lose 2-6, 6-7, 7-5, 6-4, 13-11. Angelique Kerber denied Serena Williams her 24th Grand Slam, winning in straight sets 6-3, 6-3 with a surprising ease. This is the third Grand Slam for the German after Australian Open and US Open title in 2016. She is the first German woman to win the title after Steffi Graf who won in 1996. This was Serena’s first Grand Slam final since the 2017 Australian Open. 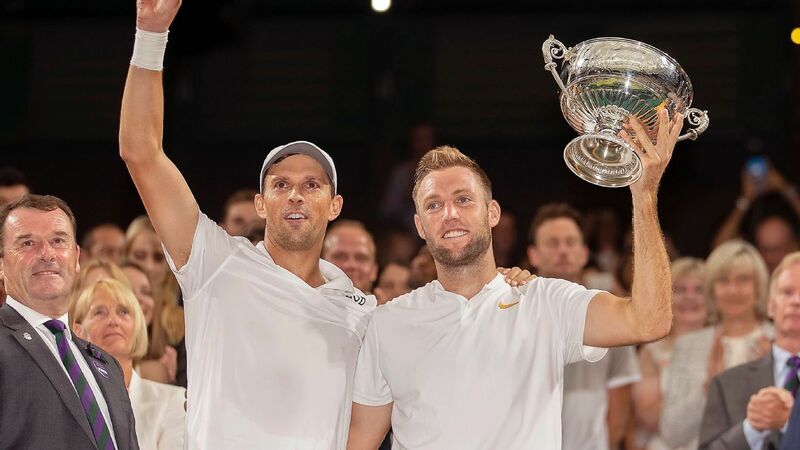 The American pair of Mike Bryan and Jack Sock defeated South Africa – New Zealand pair of Raven Klaasen and Michael Venus in 5 sets 6-3, 6-7, 6-3, 5-7, 7-5. This was Mike Bryan’s first major title with his twin and the inseparable partner Bob Bryan. This was Mike Bryan’s 22nd Grand Slam Doubles title while Jack Sock won his 2nd Doubles Grand Slam with the Wimbledon trophy. The Czech duo of Barbora Krejcikova and Katerina Siniakova won their second successive Grand Slam title with a 6-4, 4-6, 6-0 victory over Kveta Peschke and Nicole Melichar. The Austrian – American pair of Alexander Peya and Nicole Melichar defeated Victoria Azarenka and Jamie Murray 7-6, 6-3. This was Peya and Melichar’s first Grand Slam title of any kind.